The Italian Supper is back with two wine dinners, in collaboration with SWIG, and featuring wine from La Calcinara, in the East of Italy. The dinners are in Hackney and take place on Tuesday 3rd and Wednesday 4th October 2017, with tickets costing just £40 for a welcome drink and 4 courses, with extra wine flights available to buy. 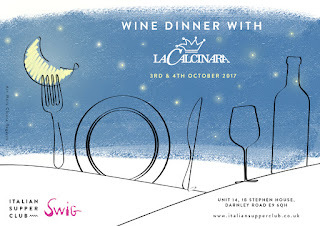 "We are thrilled to collaborate with SWIG wines and host Eleonora Berluti from La Calcinara, a 9-hectare vineyard in the Conero, an area of Le Marche characterized by limestone soils and close proximity to the sea. These features combined with organic, hands off methods give the wines a unique and irresistible character. Expect autumn flavours, wine stories and our classic convivial atmosphere! Dinners will be hosted a Stephen House Studio in London Fields, ticket includes a welcome drink and 4 courses. It is also possible to purchase the full experience, which includes a tasting of all Eleonora’s wines."